Hey all! I just wanted to give you the heads up. My parents are coming in town tonight through Wednesday for a visit, so I have some guest posts scheduled for next week! Share With You Sunday will be posted as normal though! I have another polish from the China Glaze Glitz Bitz n' Pieces collection to show you today. I'm hearing a lot of mixed thoughts on these polishes. I've heard people love them, and I've heard people describe them as yucky and gross. The yucky and gross comments make me sad, though I do admit when it has come to some nail polish collections I didn't like I've said the same! I honestly think these are awesome polishes! The polish I have for you today is the red and black combo called Scattered and Tattered. Again, I'm showing you this swatch as an accent nail in way I'd wear this as a manicure. Scattered and Tattered is a mixture of varying sized red and black glitters with black bar glitters in a clear base. Awesome possum! I love this one too. I love the combination of red with black. The combination of glitters as far as color, size, and shape provide great contrast and create a really cool look. This was also really easy to apply. I've said before, I'm not a fan of bar glitter, but the way these are mixed with the other glitters I think it looks great! 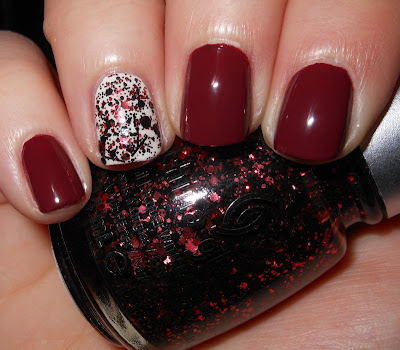 I personally love these glitters and I really like your combination of accent nail and that beautiful red creme! I got this one - it looks so cool!